To add a new organizer, navigate to M.E. Calendar > Organizers. Enter a name, slug, telephone number, email, the url of the organizers profile page (if they have one), and upload an image to serve as there portrait. Then click Add New Organizer. Now go to your Google Calendar and click on the Add > Add by URL link. 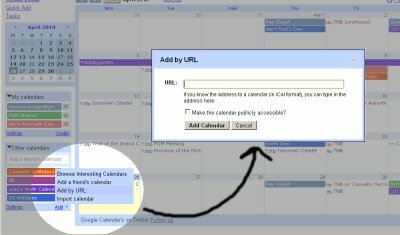 Paste your Moodle calendar URL into the Public Calendar Address: field and click the Add button. Your Moodle calendar should now sync with your Google Calendar based on the options you selected. In the URL box, paste the TSheets calendar subscription URL you copied in step 3 at the beginning of this document, and click Add Calendar. iPhone and Other iOS Devices From your computer, email yourself a copy of the link found from step 3 at the beginning of this document.